I would like something to this extent in any case. Even with the MP out there. A redeco of Combiner Wars Prime with a trailer would work for me. The mold is already designed to combine with stuff. What's that? Energon Optimus you say? WILL DO! I hope it's true and I hope he includes Minimus Ambus in some capacity. ...if I ever meet you face to face, buddy, I'm going to avenge my dead joy. what's with all the minimus ambus love?! i want datum, or suture! I care way more about Powered Convoy than Ultra Magnus, so if this toy is really going to happen, I'd want the hypothetical inner-robot to be a white cab Optimus that can be repainted into a blue cab Optimus. Minimus Ambus wouldn't really work for that. So, anybody want to buy a City Commander? I know this is actually completely irrelevant but seeing the stand-alone art of Ultra Magnus on the cover of this week's issue of MTMTE was making me think of Ultra Magnus Toys in the days leading up to this rumor. We don't get a lot of stand-alone individual dude pin-up comic book cover art that isn't somebody's packaging illustration. But it's by Cahill (not Jimenez or some other mainstream comics guy) and it's a bit early for that sort of thing if the toy is real, which obviously disqualifies it, but it had gotten me thinking about an Ultra Magnus toy all the same. Definitely hoping for an IDW Magnus with no inner robot. I don't want the vehicle mode or big robot to suffer in any way that including a smaller figure being able to fit inside somehow would. Easy compromise: sell them separately. I doubt they'll bother at all. They're not 100% on doing comic designs straight up. I think Brainstorm might be the most recent figure that matches his comic version so well. I'd count Jetfire, but we don't know if his new design is based on the toy or the other way around. I think Jetfire is definitely a case of the comic being based on the toy. I'd like to see a heavy IDW influence, ideally including an Ambus, but I don't know how you really make that work without compromising the larger whole. I mean, who wants another G1 Ultra Magnus? I mean, that guy was rubbish, right? It's a dude in a thing, and not in the good way like IDW. I love him, BUT. It's 2014. Can it be done? 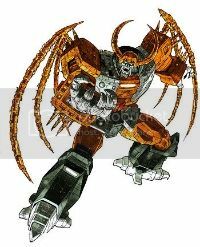 Can you design a little guy who fits into some framework made out of a larger guy who can still transform and Not Be Awful, in all possible modes? Given MP Magnus is already ignoring that Magnus is a white Optimus in armor, I'd be surprised if a separate team decided to make a second modern Ultra Magnus toy that also doesn't incorporate it, but almost no other recent Magnus toy can be bothered, so I won't be shocked if it's just a generic one-piece guy. And then I won't buy it and I'm sure Hasbro will still be able to sleep at night. I mean, who wants another G1 Ultra Magnus? I do. I love robots that combine with stuff to form bigger robots, and modern Ultra Magus toys haven't done that for me. I just want Ultra Magnus. Compared to a leader class Magnus, an in-scale Minimus would be Minicon sized anyway. Given the fact that we have not seen or heard about this at any convention yet I'm going to have to side with the fact that someone made a mistake or is screwing with us. As It would rock and be a nice addition to my collection I'm not going to hold my breath. Its real. I was surprised they showed Leader Thundercracker off first. Edited by Venksta, 27 October 2014 - 11:42 PM. Is it bad that Im so out of the loop when it come to the comics that I have no idea who this Mini Abomnious you all keep talking about? IDW comics felt like Ultra Magnus needed an inner robot after all, something they had not touched on at all in the 7 or so years of the comic's run, but they also didn't want Ultra Magnus to actually be Ultra Magnus so when the real Ultra Magnus died early in the war, his name was secretly passed down to other guys who wore the Magnus armor to continue being Ultra Magnus. The current Ultra Magnus is a new guy called Minimus Ambus. Edited by C16, 27 October 2014 - 11:46 PM.